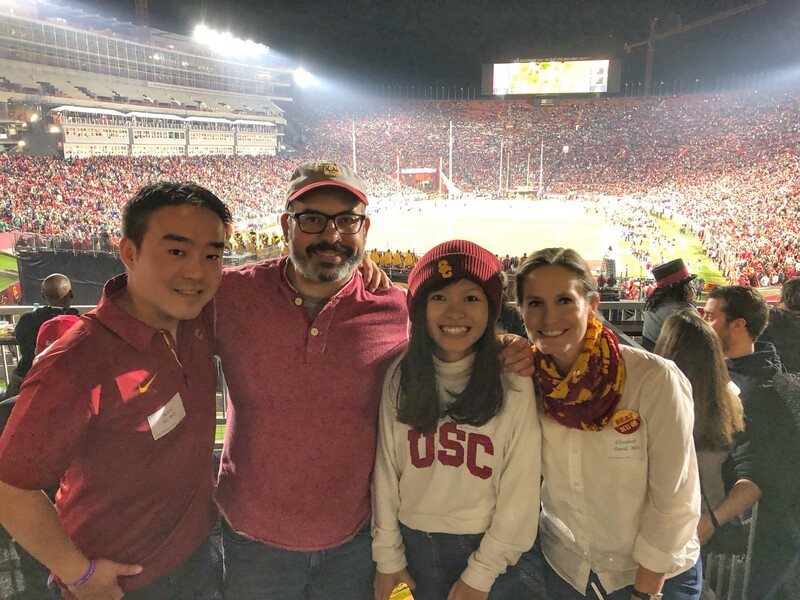 I remembered calling USC Norris from Saigon at midnight (which is around 9 am in Los Angeles), “Hello, I’m a USC Alumni, and also a former patient. I’m currently in Vietnam, and a doctor here told me that I have cancer. Can you help me find a lung cancer physician that have the earliest available appointment?” — and they set me up with Dr. Jorge Nieva. For the first year of treatment, the team was only me and Jorge. But then when the second year comes around, I got more symptoms that need special care. Jorge put me in touch with Jason Ye — a radiation oncologist who helped me with a small spot in my rib. I went through 10 sessions of radiation peacefully without much fatigue in early 2018. Tagrisso didn’t work as effectively as Tarceva, and I end up with a pleurodesis surgery by Dr. Elizabeth David. Needless to say, she is quite amazing with such a complicated surgery. There is no more fluid build up in my lung since after the surgery. On [Day 694], we started chemotherapy — which is the toughest thing I’ve ever been. I went to Vietnam for 2 weeks after my second round of chemo — where I believed I got flu. The combination of flu and side effects created some interesting events in the 3rd round. We did a CT scan 2 weeks ago and very happy to see the tumor-shrinking a lot — which is terrific! I haven’t seen a football game in the past 10 years. And though USC didn’t win today, it’s an awesome game. We stayed until the very end to see the final touchdown. That’s the spirit, winning or not, I wanna see things through until the very end! We cannot choose whether we have cancer or not, but we certainly have choices after the diagnosis. The most important thing in life is to live it!